As reported last night, ongoing concerns that China's economy is doing far worse than reported when the PBOC lowered its Yuan fixing below expected to the lowest level since August 31, pushed copper futures to a new low not seen since May 2009 while nickel dropped to the lowest level since 2003. A big catalyst for the ongoing collapse in the Bloomberg commodity index which just hit a fresh 16 year low, is the relentless surge in the dollar, with the DXY rising as high as 99.98 the highest since April, as a result of rising prospects for a December U.S. rake hike (odds are now at 70%, up from 36% a month ago) boosting currency differentials and flows into the USD, making commodities more expensive for buyers in other currencies. As Bloomberg also notes, a London Metal Exchange Index of six industrial metals has fallen for six weeks. Gold has dropped for five straight weeks, crude oil is on a three-week losing run. 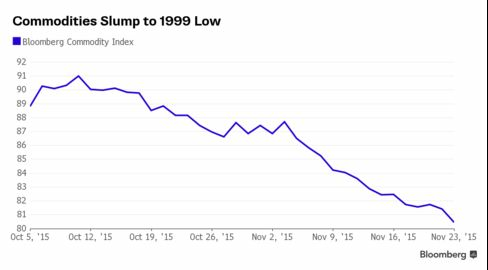 The Bloomberg Commodity Index is set for its worst year since the financial crisis, plunging 23 percent. The result is that global miners continue to suffer and basic resource stocks are taking their lead from the slide in commodities. All 17 members of the Stoxx 600 Basic Resources Index are falling today, with Glencore and ArcelorMittal dropping as much as 5 percent. 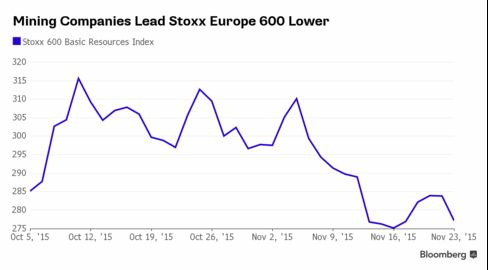 The gauge is this year's worst performing industry group on the Stoxx Europe 600 Index, falling 26 percent. Along with utilities it's the only one to have fallen out of nineteen. Glencore's 2015 decline is 70 percent. Anglo American's is 65 percent. ArcelorMittal has sunk 50 percent. It's not just the metals though: crude also started the session off on the wrong foot, following this weekend's comments from Venezuela that oil prices may drop to as low as the mid-$20s a barrel unless OPEC takes action to stabilize the market, Venezuelan Oil Minister Eulogio Del Pino said. This confirms what Goldman warned last week when it predicted oil dropping as low as $25/barrel if warm weather continues over the winter. According to Bloomberg, Venezuela is urging the Organization of Petroleum Exporting Countries to adopt an “equilibrium price” that covers the cost of new investment in production capacity, Del Pino told reporters Sunday in Tehran. Saudi Arabia and Qatar are considering his country’s proposal for an equilibrium price at $88 a barrel, he said. Sure, every producer would like a higher price, only problem is nobody wants to be the first to cut production, and so the race to the bottom will accelerate. OPEC ministers plan to meet on Dec. 4 to assess the producer group’s output policy amid a global supply glut that has pushed down crude prices by 45 percent in the last 12 months. OPEC supplies about 40 percent of the world’s production and has exceeded its official output ceiling of 30 million barrels a day for 17 months as it defends its share of the market. 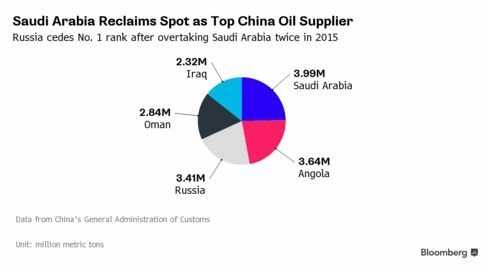 Also not helping the oil story was news overnight that Chinese oil imports declined even as Saudi Arabia reclaimed its position from Russia as the largest crude supplier to China as OPEC members extended their global fight for market share. The world’s biggest oil exporter sold 3.99 million metric tons to China in October, 0.8 percent more than in September, data from the Beijing-based General Administration of Customs showed on Monday. Angola, another member of the Organization of Petroleum Exporting Countries, also surpassed Russia in shipping crude to the Asian nation. Russia supplied 3.41 million tons to its neighbor in October, a 16 percent drop from a record in September. Angola’s shipments climbed 27 percent from the previous month to 3.64 million tons, the data showed. Which means that oil has a lot more downside before a new equilibrium price is established as producers remain reluctant to stop pumping in a deflationary environment where their only hope is to offset sliding prices with soaring volume. As a result the rolled over WTI January contract was down 3% at last check, down $1.24, and also en route to test the $30-handle which its now expired December contract would be solidly inside.